Christmas in Belarus, similar to Christmas in Albania, often takes second place to New Year’s Eve celebrations, a holdover from Soviet times, when ideology demanded the abandonment of “Western” and religious holidays. However, Belarus does have a historical connection with Christmas, and observance of it becomes increasingly popular—and even if New Year’s is the bigger holiday, the run-up to the first of January incorporates many of the same rituals and traditions that are used for Christmas in other countries of Eastern Europe. Prior to Christianity, the darkest period of the year was associated with the winter solstice, and two weeks were set aside for this time, called Kaliady. Belarus remembers its roots, though Christianity (or atheism) has replaced paganism. Those who are members of the Orthodox Church celebrate Christmas on January 7, while Protestants and Catholics celebrate on December 25. Customs for Kućcia, or Christmas Eve, are similar to those in neighboring countries. The table may be spread with hay before the tablecloth is draped over it, reminiscent of the hay that padded the manger where Jesus was born. Traditionally, the Christmas Eve dinner is served without meat and consists of at least 12 fish, mushroom, and vegetable dishes. The number twelve signifies the 12 Apostles. Bread is broken between family members rather than cut with a knife, and after the dinner is eaten, the table remains as it is so that ancestral spirits may partake of the meal at night. Caroling is also a part of Belarus Christmas traditions. As in other countries, this tradition has its roots in older, pagan traditions, when troupes of carolers would dress up as animals and fantastic beasts to scare away evil spirits and collect money or food in return for their services. Today, usually only children go caroling, though now even that is not so common. Many of the traditions that serve as New Year’s traditions in Belarus serve as Christmas traditions elsewhere. For example, the New Year’s tree is essentially a Christmas tree decorated for a different holiday. People may also exchange gifts on New Year’s instead of Christmas, depending upon family tradition. Those who do not have a Christmas Eve feast will instead have a large New Year’s Eve dinner with plenty to eat and drink. Additionally, cities in Belarus such as Minsk organize concerts and performances related to the New Year, though these are secular in nature. People from neighboring countries, especially Russia, flock to Belarus to escape crowded cities and enjoy lower prices. That is why Belarus sees a surge in tourism for the Christmas and New Year’s holidays. Interestingly, the opposite is true for Belarusians, who seek out neighboring countries to visit for their Christmas and New Year holidays. And, due to the close historical connections between Belarus and countries such as Ukraine, Poland, Lithuania, and Russia, Belarusians may have family connections in these countries meaning that they can enjoy renewing relationships with relatives. 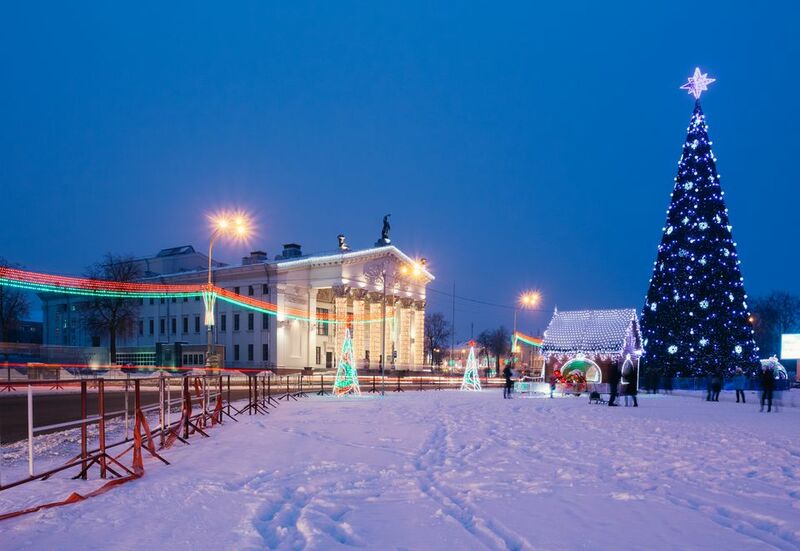 Christmas markets in Minsk appear on Kastrychnitskaya Square and near the Palace of Sports. These markets serve both celebrants of both Christmas and New Year with foods, gifts, and opportunities to meet Grandfather Frost. The artisans of Belarus sell traditional crafts such as straw ornaments, wooden figurines, woven flax textiles, ceramics, valenki, and more. How Do People Celebrate Christmas in Slovakia? When Is Christmas Celebrated in Ukraine?